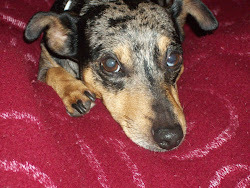 AFTER A DAY OF CONTEMPLATION AND SOUL SEARCHING, I HAVE DECIDED TO REACH OUT TO MY FRIENDS AND RELATIVES AND ASK YOU TO DO SOMETHING THAT HAS BEEN TROUBLING ME FOR A LONG TIME. OUR NATION IS & HAS BEEN ON THE SLIPPERY SLOPE TO HELL FOR A LONG TIME. IF YOU LOOK AROUND YOU WILL FIND CORRUPTION, GREED, MORAL DECAY AND A STEADY MOVE AWAY FROM THE THINGS THAT MADE US GREAT. THE PRINCIPLES UPON WHICH THIS NATION WAS FOUNDED ARE NO LONGER OUR BACKBONE. HOWEVER, WE CAN REVERSE THIS TREND. IN GOD'S WORD HE STATES,"IF MY PEOPLE WHO ARE CALLED BY MY NAME WILL HUMBLE THEMSELVES, AND PRAY AND SEEK MY FACE, AND TURN FROM THEIR WICKED WAYS, THEN I WILL HEAR FROM HEAVEN, AND WILL FORGIVE THEIR SIN AND HEAL THEIR LAND." I AM CONVINCED THAT WE MUST PRAY FOR OUR NATION AND ITS LEADERS AND ASK FOR FORGIVENESS. SO I ASK YOU TO JOIN ME IN THIS PLEA TO OUR LORD. IMAGINE IF EACH PERSON REACHES TEN OTHERS. IF YOU DO AND THEY COMPLY, WE WILL LIFT UP MILLIONS OF PRAYERS A DAY TO OUR CREATOR. HE WILL HEAR US AND IN FAITH WILL ANSWER! 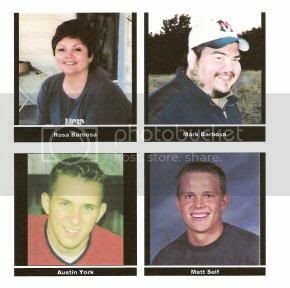 "In Jesus' name, we humbly beg for God's mercy and forgiveness, we beg Him to send forth a spiritual renewal and in doing so, heal our Land"
March 12 - 13, 2004 was a traumatic day for us all as we lost our good friends Rosa Barbosa, Mark Barbosa, Matt Self, and Austin York. This year is the 5 year anniversary. 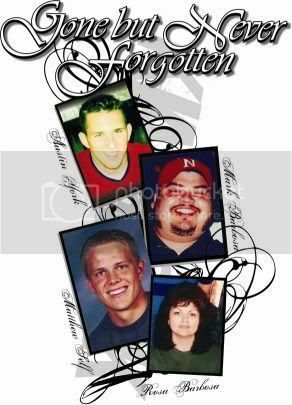 I celebrate the justice we finally have & pray that the families have comfort in their lives. 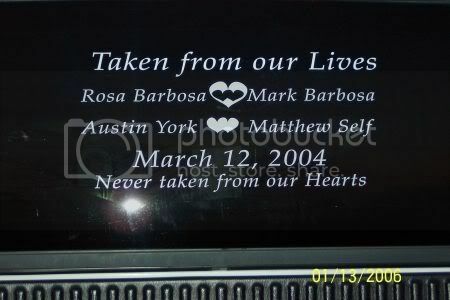 Miss you Matt & Austin (school friends) - wish I could have known you Rosa & Mark. PLEASE WATCH & SUPPORT ME! "President Obama has signed an executive order ending an 8½-year ban on federal funding for embryonic stem cell research. "At this moment, the full promise of stem cell research remains unknown, and it should not be overstated," Obama said Monday morning before signing the order. "But scientists believe these tiny cells may have the potential to help us understand, and possibly cure, some of our most devastating diseases and conditions." The President's speech was equal parts hope for the new research and support for the scientists involved in such work. "Today, with the executive order I am about to sign, we will bring the change that so many scientists and researchers, doctors and innovators, patients and loved ones have hoped for, and fought for, these past eight years: We will lift the ban on federal funding for promising embryonic stem cell research," Obama said. "We will vigorously support scientists who pursue this research. And we will aim for America to lead the world in the discoveries it one day may yield." White House officials said Sunday that the president's order will give the National Institutes of Health 120 days to develop ethical guidelines for the research. "Encompassed in [the executive order] will also be the requirements around guidelines that will be drafted by the NIH [National Institutes of Health] as they ... work with others around the country to make sure we're handling the issue responsibly," said Melody Barnes, the director of the president's Domestic Policy Council. The president also signed a memorandum that Barnes says will "restore scientific integrity in government decision making." It will help ensure public policy is "guided by sound scientific advice," she said. The memorandum covers all scientific research, including such areas as energy and climate change. The Bush administration was often accused of allowing politics to color its scientific decisions, something the administration denied. Actor Michael J. Fox, a longtime advocate for embryonic stem cell research, expressed his enthusiasm for the president's plan and commended Obama for "recognizing the inherent value of research freedom and creating an environment in which it can flourish." "Today is a new day. I'm thrilled to see President Obama has honored his commitment to get politics out of science," Fox, who has Parkinson's disease, told "Good Morning America." "The last few years have been incredibly frustrating for patients and researchers who believe that embryonic stem cell research has the potential to bring better treatment." Former first lady Nancy Reagan, who has emerged as a prominent supporter of stem cell research after her husband, President Ronald Reagan, passed away in 2004 after a 10-year battle with Alzheimer's disease, said in a statement that she is "very grateful" that Obama has reversed the federal government's policy on embryonic stem cell research funding. "These new rules will now make it possible for scientists to move forward," Reagan said in the statement. "Countless people, suffering from many different diseases, stand to benefit from the answers stem cell research can provide. We owe it to ourselves and to our children to do everything in our power to find cures for these diseases -- and soon. " "President Obama's executive order signals a new day in which science policy will be based on science and in which the federal government can invest in the best ideas with the greatest potential to improve public health," Morrison said. "America will once again seek to be the world's engine for biomedical discovery, leading the way toward new treatments for disease." But the executive order that ends President Bush's 2001 ban on such research will likely bring no such end to the fierce political debate that surrounds the use of embryonic stem cells. "